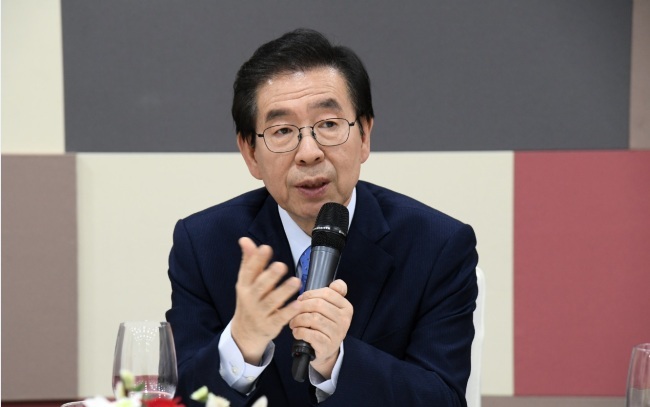 Seoul Mayor Park Won-soon expressed confidence in expanding the Zero Pay system this year, dismissing concerns over the lack of stores and people using the city-sponsored transaction platform aimed at lowering card payment-processing costs for small vendors. With the Zero Pay system, consumers can make payment at offline stores by scanning the vendor’s QR code with their smartphones. Once consumers scan the code, the money is directly transferred from their bank accounts to those of the vendors. The system was designed to help small merchants save on payment transaction fees paid to credit card companies and banks. The platform charges little to zero transaction fees -- up to 0.5 percent, depending on the size of the store’s sales. Vendors with over 800 million won ($714,000) in annual turnover do not have to pay any transaction fees. In comparison, credit card transaction fees range from 1.4 percent to 1.9 percent. Despite Park’s confidence in the success of the Zero Pay system, it has yet to be taken up widely. A lack of incentives for use of the system and inconveniences stemming from technical errors are believed to be major reasons. The Zero Pay system will come into full operation in March following a trial run launched in December. Noting that credit cards were also not well-received in Korea when they were first introduced, Park said the Zero Pay system would take root much faster than the credit card system. “It will be universally used ultimately because it is the simplest way of making payment,” he said. A total of 62,465 stores of franchises nationwide have registered or shown interest in joining the scheme, according to the Seoul Metropolitan Government. Participating franchises include Golfzon, Kyochon F&B, Ediya Coffee, emart24, Paris Croissant and Ministop Korea.